I came across A&B American Style Pepper Sauce at the First Annual NYC Hot Sauce Expo last year (which was an amazing event, thank you Steve Seabury!). Knowing that A&B is going to be in attendance again at this year’s event, I figured it was time to share this find with you, our readers. 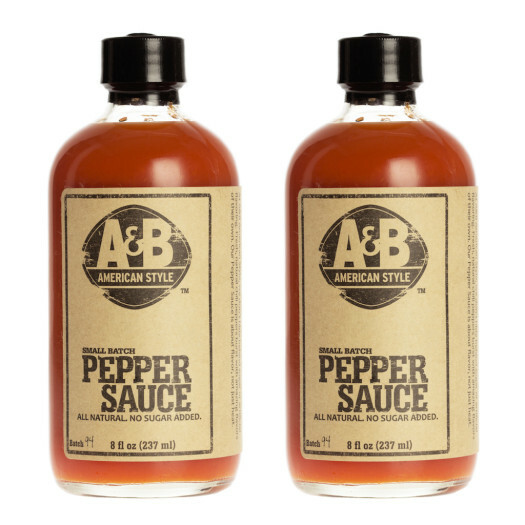 Our mission: Our Pepper Sauce is a great, all-natural replacement for your existing hot sauce, cocktail sauce or even ketchup. Though we think it’s amazing on everything you eat, it’s especially mind-blowing on oysters, shrimp, eggs and burgers. I didn’t have any oysters or shrimp on hand, but after tasting this sauce, I can see why it shines on those foods. I did try A&B on some quesadillas and pizza. Texture and Appearance: This is a thick, deep-orange sauce, with the consistency of Sriracha. It doesn’t run or separate at all, and clings to the spoon very well. Perfect. Taste straight up: A hint of sweetness comes first (from the carrots and peppers – no sugar here! ), with just a trace of vinegar. The onion and pepper flavors are extremely well-balanced, making this a very enjoyable sauce. Stellar taste. Heat level: – Mild. Only 1.5 stars, but the blend of peppers results in a heat that warms the entire mouth. Very satisfying. 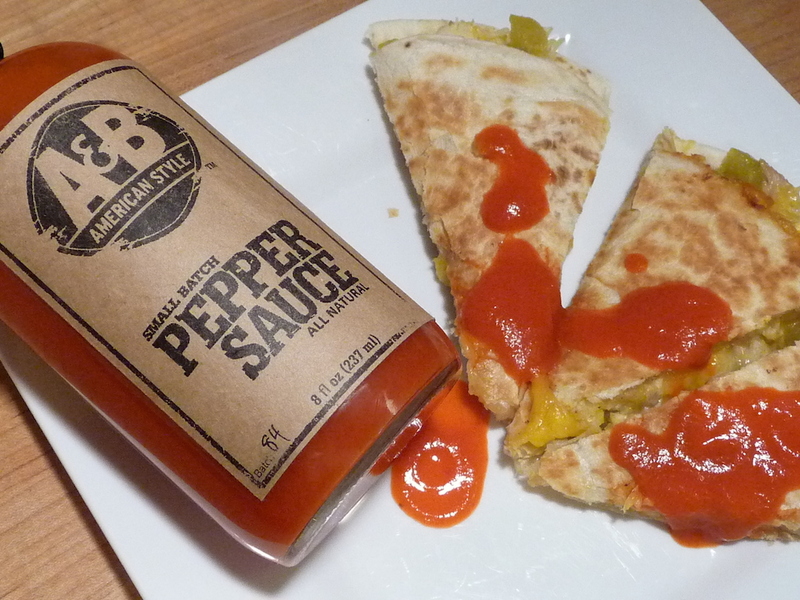 Taste on food: We tried this on chicken quesadillas, and loved it! 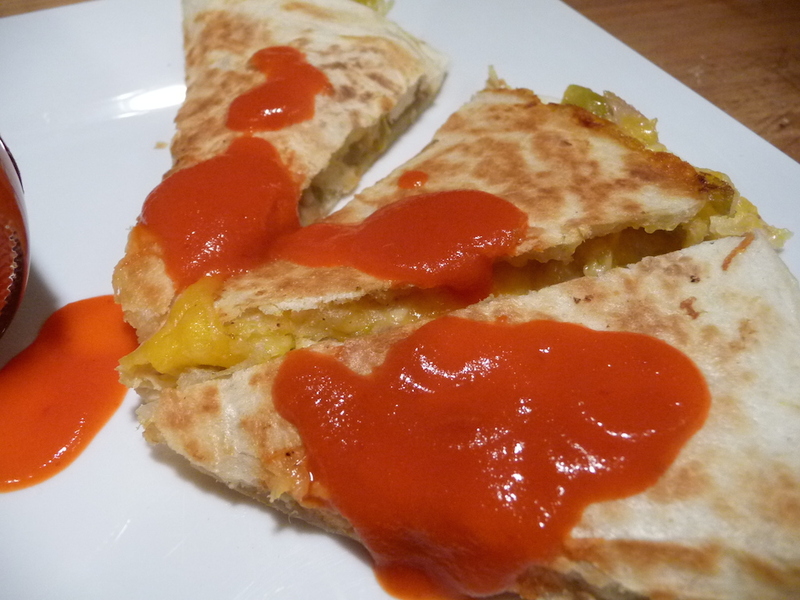 I first just dipped the quesadilla into the sauce, but when slathered on top, it set up very nicely. It actually turned into a paste on top of the warm flour tortilla. A great sauce for dipping AND slathering! Excellent! Label and Graphics: I love the old medicine-style 8 oz bottle, and the label follows that theme with old-timey fonts on a brown paper label. Classic. Overall Rating: – I give this 4 out of 5 stars for excellent overall flavor, perfect on any food you can imagine. It’s a little more expensive than other craft sauces we’ve had, but it is a great product made with great ingredients. Highly recommended. A&B on Social Media: On Facebook, Twitter, Instagram, Google+ and Pinterest. A&B’s tag line is “Flavor. Not just heat”, and they prove that with this sauce. 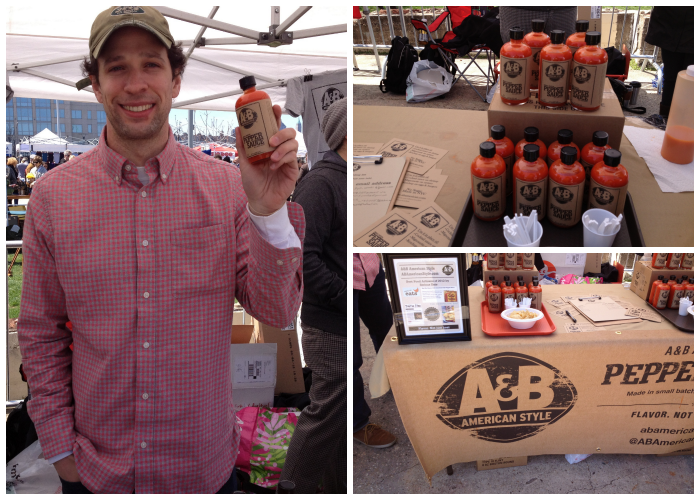 Check out their website www.abamerican.com to order their sauce and see all of the stores that carry their sauce. And tell them HotSauceDaily sent you! Lucky Dog Hot Sauce Releases New Purple Label Extra Mild + Contest! Lucky Dog Hot Sauce launches their newest flavor – Purple Label. A hickory smoked jalapeño sauce loaded with garlic and sweetened with a touch of apples and figs. Dubbed “Purple Label” in keeping with Lucky Dog Hot Sauces’ theme of naming their products after the background colors (and heat levels) of their labels, it joins their Green Label (Mild), Red Label (Medium), Orange Label (Hot) and Black Label (Extra Hot) as their mildest offering yet. 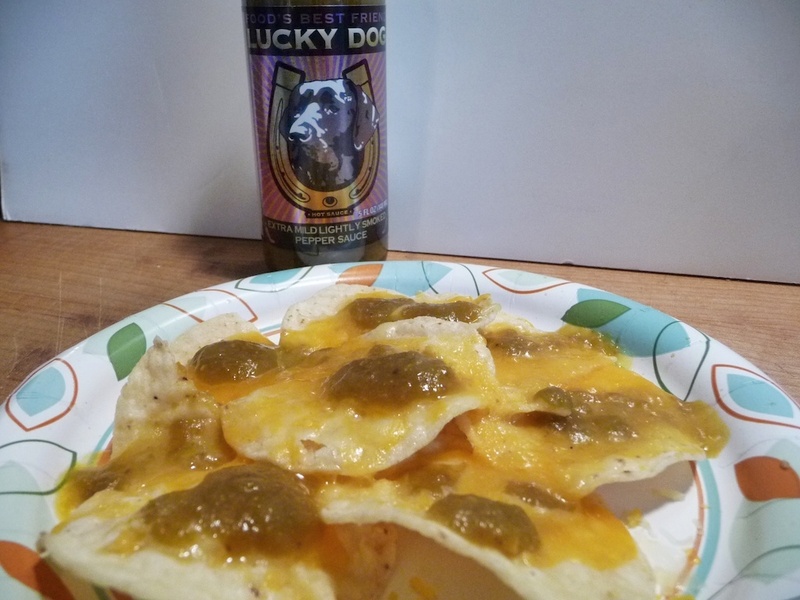 Lucky Dog Hot Sauce Triple Giveaway! We’re excited to have this opportunity to bring you an exclusive first review of the newest sauce from Lucky Dog and to host a Triple Thanksgiving Giveaway of 3 bottles of Lucky Dog Hot Sauces to one lucky winner. Read on for the review and for the details of the giveaway. Ingredients: green jalapeño peppers, distilled white vinegar, onions, organic apple sauce, garlic, carrot juice, water, carrots, hickory smoked sea salt, mission figs, lime juice concentrate. 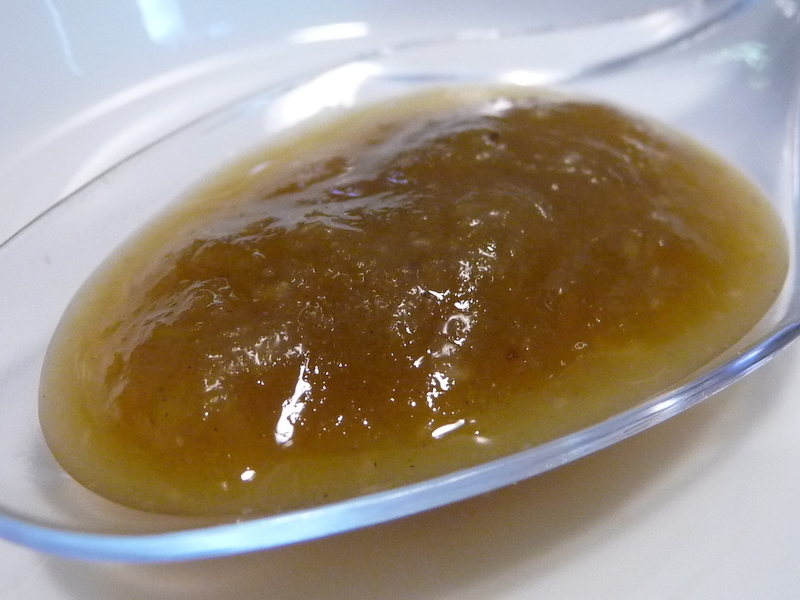 Texture & Appearance: Olive green in color, this slightly thick sauce has tiny bits of onions and garlic floating in it. The mouth feel or “chew” is pleasant. Very satisfying. Taste Straight Up: Jalapeños, onions, and garlic are the big three flavors here. The vinegar flavor is muted (most people think that’s a good thing), and the sweetness from the applesauce, carrots and figs brings it home. The lime juice adds just a touch of citrus… hardly noticeable, but one might miss it if it weren’t included. Scott knows what he’s doing here! 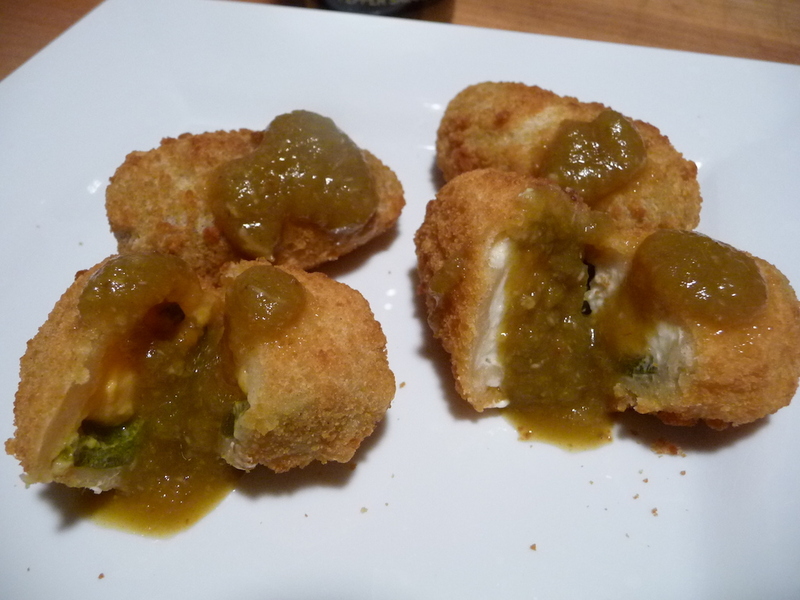 And finally, the ever so gentle smokiness really makes this sauce unique among jalapeño sauces. Delicious. Heat Level: Here’s where things get even more interesting. Upon first tasting Lucky Dog Purple Label, the heat level seems pretty high for a jalapeño sauce. The sting is strong and biting. But the more you eat it and take in all the flavors, the more tame it becomes. The smoked jalapeños have a mild heat – and coupled with the natural heat from the garlic and onions (mild as that may be), you’ve got a pretty zesty, spicy green sauce on your hands. Not mild. 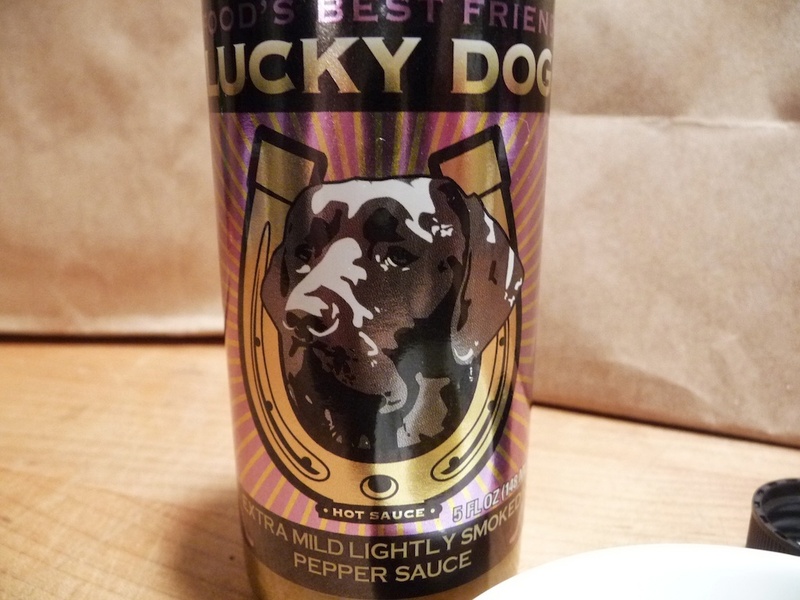 We first reviewed Scott Zalkind’s Lucky Dog Hot Sauces back when there were only 3 – the Green, Red, and Orange Labels – Lucky Dog Fire Roasted Pepper Sauce. Then Scott upped the ante with his new Black Label Extra Hot Fire Roasted Pepper Sauce, to which we gave an overall 4 Star rating as his best yet. And we still think so. But the newest Dog in the Lucky Dog stable – the Purple Label – is running as a close second in overall flavor and enjoyment. Here are a few of the foods we’ve tried it on. I fixed a small plate of simple cheese nachos, pouring on some Lucky Dog Purple Label sauce, and after heating it all up, I found the vinegar to be a bit more pronounced. Otherwise, the bright flavor of the smoked jalapeños and onions were still the big players here. 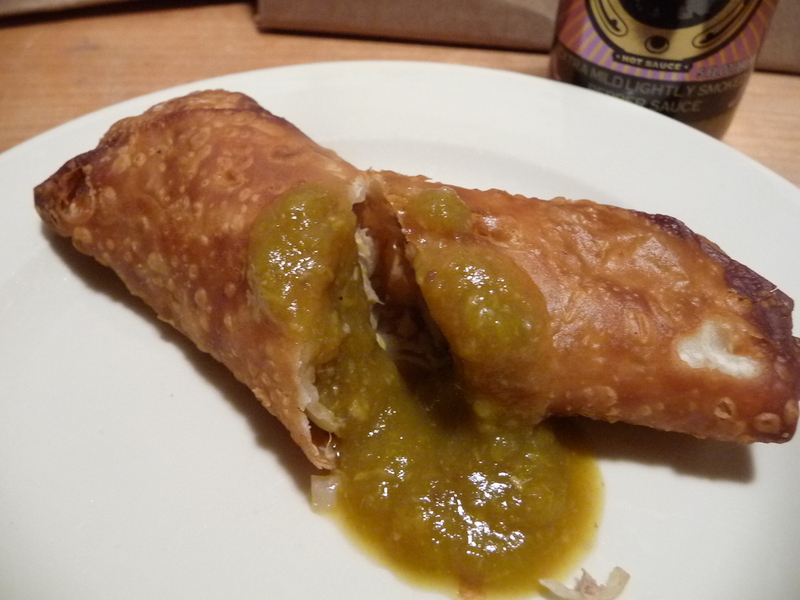 We also had some small homemade pork eggrolls to test the sauce on. Not exactly a match made in heaven, but it made for a nice photo, and you can see the sauce in action. We’re skipping our usual quickie-frozen-pizza test (a hot sauce reviewers go-to), and dipping some jalapeño poppers into the sauce instead. (Okay, we didn’t really dip them… more like poured the sauce over them). Lucky Dog Purple on Poppers – fiery and good! Heat: 1.5/5 – A pretty peppy panache of peppery pepper sauce. Seriously, while not the mildest of the milds, (Lucky Dog does tend to lean towards the higher end of the scale), flavor and burn work hand in hand here. This is a mild hot sauce (pepper sauce) to tease your in-laws with. And it’s pretty damn good for the rest of the family too. Nice beginner burn. Overall: 4/5 – Color, texture, and most of all flavor, with a very decent heat level, combine to garner this sauce a 4 Star rating. Versatile. I believe in flavor above all else, which is why Lucky Dog Hot Sauce is created with savory fire-roasted hot peppers, sweet carrots, tangy vinegar, fresh onions, assorted dried peppers, and heaps of roasted garlic. It brings a complex taste with respectable heat. Lucky Dog Hot Sauce is truly Food’s Best Friend! Lucky Dog Hot Sauces can be found at over 30+ stores in the Greater San Francisco Bay area with more stores coming soon. You can also order online at http://luckydoghotsauce.com. Lucky Dog Hot Sauce Triple Thanksgiving Giveaway! We’re giving away 3 bottles of delicious Lucky Dog Hot Sauce pepper sauces to one lucky winner, just in time for Thanksgiving! One Purple Label, one Green Label, and one Red label. Good luck!